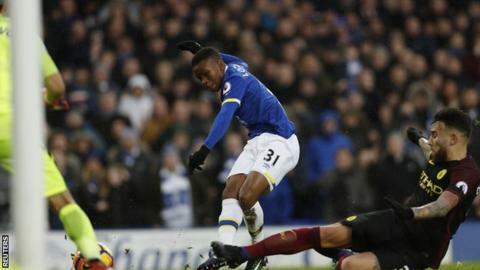 Nigeria want to persuade 19-year-old Everton striker Ademola Lookman to play for them rather than England. Lookman was born in England but can play for Nigeria through his parents. He has already played for England Under-19s and U20s but can switch allegiances because he is yet to play for the senior side. "He has Nigerian parents and we'd need to speak to him first," Nigeria Football Federation (NFF) official Bitrus Bewarang told BBC Sport. Lookman moved to Everton from Charlton earlier this month in a deal that could eventually cost £11m. He made a goalscoring debut in the side's 4-0 win over Manchester City on Sunday and has caught the attention of Bewarang, who succeeded the late Shaibu Amodu as NFF's technical director in July. "I saw him against Manchester City and I was excited to see a young player of Nigerian descent shine, so I thought why not," said Bewarang. "It is the duty of the national coach [Gernot Rohr] to invite players to the national team, but we will help him check Lookman's eligibilty." Nigeria have previously succeeded in snapping up former England youth internationals like Sone Aluko, Victor Moses, Shola Ameobi and Alex Iwobi for the Super Eagles. Bewerang is hoping that such an illustrious list could help convince Lookman to play for the three-time African champions. "We've managed to get players like Moses and Iwobi in the past and Lookman will be a great addition to the national team if we got him," Bewerang added. "We have a young side, the new coach is building a strong squad and having some youngsters from the Premier League [Kelechi Iheanacho and Alex Iwobi] could help his decision. "I am not desperate to see this happen but we will give it a shot." Lookman scored 12 goals in 49 games for Charlton, who were relegated to League One at the end of last season. He won five England Under-19 caps before making three appearances for the Under-20s, scoring once.